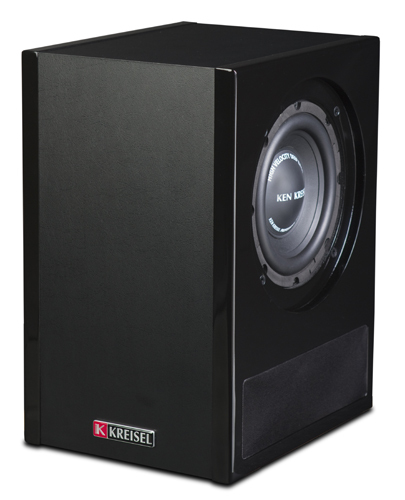 Ken Kreisel’s new dual 8 inch High Velocity High Output Push-Pull-Pulsar™ subwoofer will amaze even the most skeptical audio critic with its sonic speed, power, detail, and explosive impact. 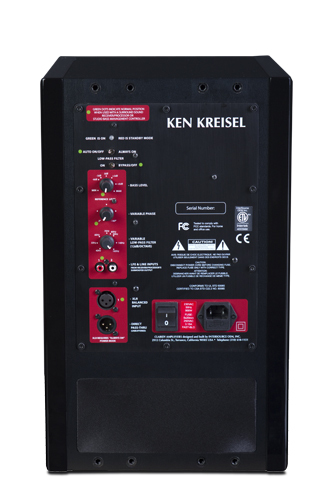 It’s a scaled down version of the new DXD-12012, occupying a footprint of one square foot, and, Like Father Like Son, it uses the identical 750+ watt Continuous RMS Dual Class D Push-Pull Monoblock Amps™, delivering the same KEN KREISEL™ Studio Proven Signature Sound. Good things do come in small packages. Cone Design: The dual 8 inch drivers are KEN KREISEL PROFESSIONAL SOUND™ low-mass long-throw HIGH VELOCITY DEEP BASS™ drivers. They are comprised of a very strong long fiber pulp blend cone material which offers maximum strength and rigidity while maintaining minimum mass. The front of the cone is treated with a specialized coating compound. The dust cap is constructed of a long fiber pulp blend with an additional layer of coating on the front side. The combination of cone angle, dust cap diameter, shape and geometry have been meticulously selected to provide near perfect piston emulation, maximum cone area efficiency, and controlled high velocity characteristics in both the inward and outward directions. The impedance on each driver is a nominal 4 ohms. Amplifier Design: Newly developed Claridy™ Dual Class D Push-Pull Cross-Coupled High Current - Hybrid Bridge Monoblock™ amplifiers and Dual Integrated Cross-Coupled High Speed Switching power supplies with a total power output of 750+ Conservative Continuous RMS watts from two 375+ watt Cross-Coupled Monoblock Amps. 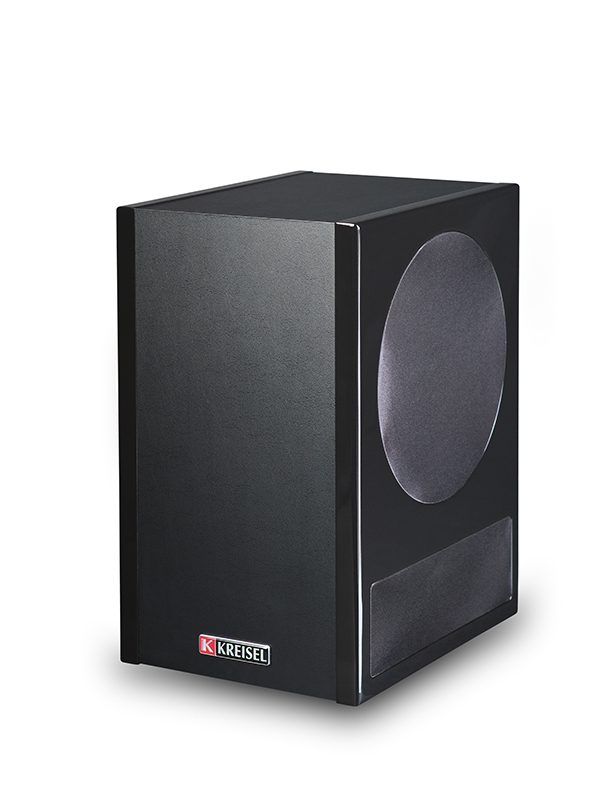 These powerful Claridy amplifiers provide the KEN KREISEL PROFESSIONAL SOUND™ Long-Throw High Velocity Deep Bass™ drivers with a stable and tight electrical drive with a conservatively rated 750+ watts of continuous RMS power, and almost 3 times that in peak wattage output whenever it is needed. 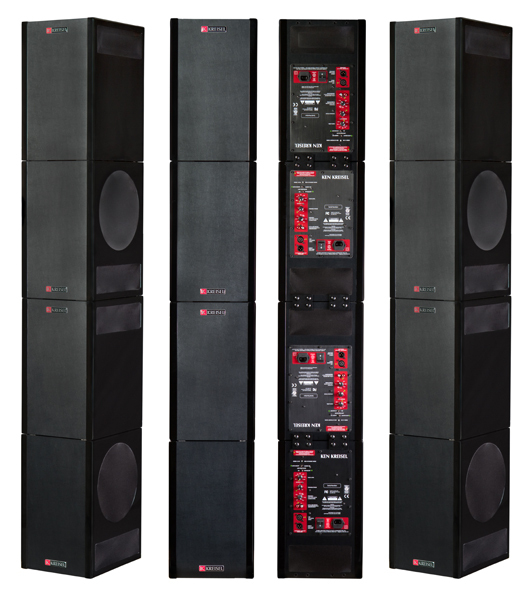 The power house in the DXD-808 subwoofers, these amps overcome many of the limitations of Class D amplifiers and switching power supplies. Most Class D amplifiers exhibit poor sounding clipping characteristics which require aggressive use of limiting circuits to prevent any amplifier clipping on high transient peaks. These Claridy amps have near ideal clipping characteristics allowing very minimal use of any type of limiting circuitry which assures maximum headroom capability yielding superb high level bass detail not heard from other subwoofers. The DXD-808 uses two completely separate and physically isolated Pure Monoblock Claridy amplifiers, with each amplifier utilizing its own separate and independent 400+ continuous watt high speed switching power supply. Each of these monoblock amplifiers feeds one 4 ohm HIGH VELOCITY DEEP BASS™ subwoofer driver. The two amplifiers are run in a balanced Hybrid-bridge Push-Pull™ configuration so the two amplifiers are electrically out-of-phase with each other and the two 400+ watt power supplies are cross-coupled (connected together) making a 800+ watt power supply with a "+" voltage and a "-" voltage. Because the two amplifiers are running out of phase, with one amp swinging a positive 400+ watts while the other amp swings a negative 400+ watts, the power supply is balanced with plenty of reserve energy as the 800+ watt power supply only has to deliver 400+ watts at any one time. Cabinet Design: Sealed Box with "raw" driver in the box exhibiting a "Q" of .5 - .707 (before any electronic EQ) which results in optimum transient performance with a natural roll-off of 12dB/octave. Footprint of only 1 Square Foot with hand buffed and polished high gloss black MDF side panels. The body of the cabinet is covered with beautiful simulated black leather and sports a jeweled logo. The interior of the cabinet uses additional high grade MDF panels to further reinforce the area where the drivers are mounted to the cabinet. (446.5 x 275 x 332mm) 35.16" x 10.83" x 13.07"
(893 x 275 x 332mm) 70.32" x 10.83" x 13.07"